When I was five years old, I walked to school. Sometimes on my own and sometimes with my brother. While it was a short distance — less than one kilometer — we walked to school un-escorted. No parent or care provider or even an older kid…walked with us. I know times were different back then. Like, really different. 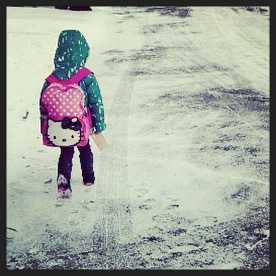 Because my daughter is five years old and I can’t imagine sending her off to school on her own. Not even at six years of age. Walking to school is a good thing – isn’t it? The number of times we have been asked by our suburban counterparts if we “really think it’s a good idea” in patronizing tones, implying that walking/riding to school WITH our child is some kind of abhorrent act of living on the edge is too many to count. In my neighbourhood it’s not such an odd thing to see children walking to school. The younger ones are under adult supervision, and the older kids are not. I’m not sure what the cut off is for when you let your child go off on her own…it terrifies me a little bit, but frankly, walking is a good thing. As I got older walking to school helped me transition from a home to school mindset. When walking with a friend, it provided that coveted secret sharing and one-on-one friend-talk time. When walking with a group of friends, it provided a sense of camaraderie. In all these scenarios, it provided much needed exercise. But I will say this. On those freezing minus 25°C,where the windchill makes it feel like minus 30°C, days…no, I don’t want my daughter walking to school. No one needs to be outside for any length of time in that kind of cold weather. This whole walk or not debate is going to be a big one for many Ottawa families in the coming months. The Ottawa Student Transportation Authority is changing the bus routes in 2015 which means families who no longer live within the new bus route plan will need to make alternate arrangements for their children. It’s part of a healthy schools initiative to get children more active. Some schools are piloting a walking school bus program which is pretty cool. Be interesting to see how/if this kind of program takes off across the city. Truthfully, this re-routing of the bus routes doesn’t impact my family directly but it will be interesting to see how I feel when my daughter moves on to the next school, which is just over two kilometers away from where we live. Will she walk? Will we drive her? I don’t know yet. But I hope she walks. If you have school age children who walk to school, at what age did you set them off on their own? Mom- It’s a different time for sure. Even if my girl only walked three blocks…I still wouldn’t have her walk to school un-escorted…definitely not at five years of age and not at six years of age either. I admit there was a time I thought I’d never let my kids walk without supervision – but here we are. My husband walks all three to school as a group, but my older two – ages 10 and 11 – are now allowed to stay for a half hour after school to play with their friends, then walk home on their own. I like it better when they are walking home together, but sometimes one wants to stay and not the other, so there have been times when each has walked home completely alone. This is our first year of allowing this and we had a BIG talk about THE RULES, but so far, so good. I still pick up the 7 year old, though, and plan to until she’s at least 10. I think 10 is a good age to go on their own. I’d be comfortable with that. I think. I walked to school, first with my mom, then with my big sister, when I got older I was paid to walk another little girl home from school. When I was in high school I took the bus to school and started walking home and became more fit than I had even been before. My daughter, on the other hand, has a major intersection between home and her school, and I don’t know when I’ll be comfortable with that. I’m not sure I’d be comfortable with my girl walking across a major intersection on her own either.